Our simple design is a perfect application of the principle of nature’s own law of gravity in separating lighter-than water wastes from heavier-than-water matter. These light-density substances, as well as oily, greasy sludge or solids, are retained in the Rockford Separator. Note the course of water travel in cut-open view. The arrows designate the course from the inlet through the first separating screen, upward and through the second separating screen, downward through the filter and flow regulator screen to the outlet, and upward to the drainage line. There is no straight in-and-out travel from the inlet to the outlet of the separator. For continuous or severe operation, consult our Engineering Department. Rockford Oil Separators are designed to receive, directly from plant equipment or floor drains, various kinds of oils, gasoline, kerosene, naphtha, benzene, other volatile liquid waste, and sludge. They retain this harmful waste matter and prevent its entry into the drainage system, providing triple advantages. Loss of a salable or reusable by-product. The separator is built of all-welded heavy-duty steel plate for maximum strength and durability. Both the interior and exterior are coated to resist acid corrosion. These units have removable covers for on-the-floor, partially recessed or flush-with-floor installation, suitable for pedestrian traffic or reinforced for heavy traffic. The cover is secured to the body with recessed stainless steel bolts and includes an extra-heavy leakproof gasket. Separating screens and a flow-regulator filter screen regulate flow and filter waste water, making outside flow control or retarder unnecessary. An extra-large inlet compartment has adjustable oil draw-off. The outlet is separated from the main body of the unit, meeting all plumbing code requirements of an outside visible trap seal. Independent internal vent connection on the inlet compartment dissipates excessive fumes and vapors from evaporating gases and volatile liquids. The outlet of the separator is vented to prevent siphoning of its contents into the drainage system. All units are available in double-wall construction with leak detection if specified. The basic requirement for efficient retention of non-soluble oil or other volatile liquid wastes is the absence of turbulence in the waste water movement. This is accomplished in the Rockford Separator by its design for maximum water travel without agitation and by the filtering action of its screens. The combination of two separating screens and a flow-regulator filter screen reduces the turbulence to allow proper separation, and prevents the evacuation of solids into the drainage system. The absence of a solids-evacuating channel is additional proof of the non-turbulent flow through the separator. Visible double-wall outside trap seal with vent connection prevents siphoning. Separate internal vent connection keeps pressure from building up inside the unit and from forcing contents into the drainage system. The independent vent also releases any fumes which may build up inside the unit. The wet inlet design prevents the entry of sewer air into the premises. 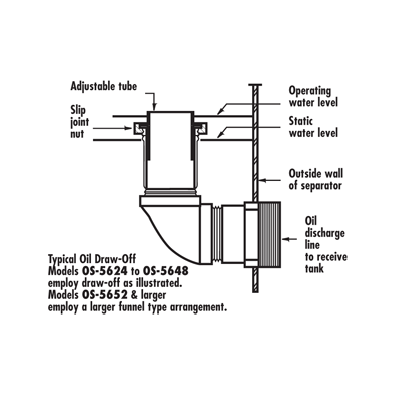 The oil draw-off funnel is adjustable to the gravity height of oil and gallon-per-minute flow. It leads into the oil discharge pipe, from which a suitable disposal of oil can be made in the most economical way. After the separator is installed, establish the operating water level by running water through the separator at the maximum flow rate expected. Adjust the vertical draw-off pipe 1/8" to 1/4" above the water line. Periodic checking of this level after the separator is in operation will ensure the proper functioning of the oil draw-off. 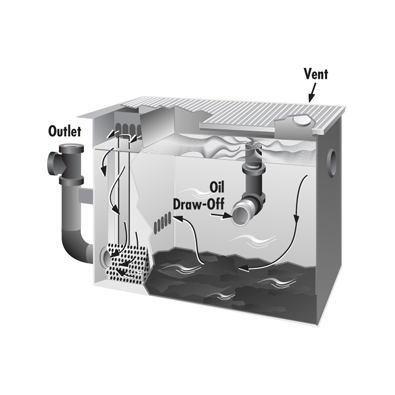 If draw-off oil contains any water, raise the vertical draw-off pipe until only oil flows from the separator. The maximum amount of waste water containing non-soluble oil that can be discharged through any listed separator is two (2) times the stated flow rate in g.p.m. For example, a separator rated at 50 g.p.m. may only have 100 gallons discharged through it in a one-hour time period. This is usually accomplished by a batch dumping process. However, 100 gallons may be discharged continuously if the flow rate is monitored at the rate of 1.66 g.p.m. Removable polypropylene coalescing pack within a stainless steel framework is used to separate droplets of oil too minute to be removed by separation alone. Some oil-laden wastes carry with them small particles of suspended matter. For such installations, we recommend the OS Series separator be ordered with a filter medium. This will keep the tiny particles of suspended matter with attached oil globules from passing into the drainage line. Replacement filter screen with factory-installed filter medium is available as a replacement part. When an oil separator is installed in an automobile, truck, bus, or tractor garage, in a service station or in a repair shop with facilities for motor or transmission overhauling, it must have a minimum static water depth of 24 inches below the invert of the separator outlet and a minimum static water capacity of 6 cubic feet. This regulation applies to facilities where not more than three vehicles are serviced. For each additional vehicle up to and including ten, 1 cubic foot of static capacity shall be added. For each vehicle over ten, an additional 0.25 cubic foot shall be added. In motor vehicle storage facilities, a combination separator-drain shall be installed with a static water level of 1 gallon for every 100 square feet of area to be drained. Where motor vehicles are serviced and stored, an oil separator shall be installed with a static water capacity of 1 cubic foot for every 100 square feet of area to be drained. The oil separator shall have a minimum static water level of 6 cubic feet. Check local codes for specific requirements. Where motor cleaning services are rendered at mechanical car washing facilities, an oil separator shall be installed in that section of the drainage system which receives waste water from this operation. In a one-car washing facility, a combination separator-drain shall be installed with a minimum static water capacity of 30 gallons. Upon inspection of your plant and testing of the waste oil sample received, we submit a report similar to the following for your consideration. Based upon the information received from the local sanitary district office, 200 ppm of oil is being discharged into the sewer. This totals out to 589 gallons per month. This concurs with the figure of 600 gallons per month that is purchased and consumed in your operations (589 gallons vs. 600 gallons). Research and experimental work have led to the adoption of fundamental principles which provide mathematical bases for the determination of separator size and shape. These principles have been applied, and the results are separators demonstrating highly effective performance. It must be noted that the design and shape of the separator depend upon the character and quantity of the oily water to be separated. Even a properly sized separator is limited to the separation of oils and solids which are susceptible to gravity separation. It must also be noted that modifications, and possible refinements to this design can result in separators with improvements and merits. The following design criteria is based upon a mathematical formula resulting from research done, and upon which Rockford Separators base their design. A minimum ratio of depth to width of 0.3 (0.5 maximum). The design of this separator was calculated using varying temperatures of waste water from 70°F to 100°F. We are presenting design information based upon a temperature of 100°F, which in our estimation, is more likely to be the average temperature.